Thanks to Dave Cameron VE7LTD, his commitment, time and effort, we have the UHF repeater VE7RNV on 444.950, back on the air! Dave has donated a new 444.950 UHF repeater to our Club as well as a new VHF repeater for 147.260. His donations replace equipment that has been in service since the early nineties and was initially installed by Bob Chapman VE7BCA. With the donation and installation of an additional VHF antenna by Telus, the Fromme site now supports the VHF repeater VE7RNV on 147.26, the VECTOR repeater, VE7RVF on 145.450 and the DX Club repeater VE7RDX on 147.300 as well as our UHF repeater, VE7RNV on 444.950. 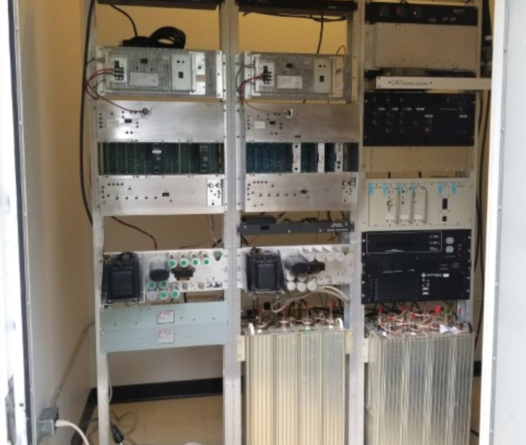 In addition, the 147.26 repeater has been replaced and now transmits a 156.7Hz tone: you don’t need a tone to key the repeater but may use the tone-squelch mode in your rig to eliminate interference when the repeater is not on air. Again, this is all thanks to Dave for his initiative. Thanks, again to Dave and Bob for their on-going help, support and enthusiasm over the years in providing repeater services for our Club members and others. The GPS Disciplined Oscillator generates a very stable and very accurate 10 MHz sine wave signal, as well as a very predictable digital pulse per second. The devices use the pulse per second to ensure that the frequency reference is very accurate. The signal is accurate to 10 parts per trillion, which means the 10 MHz oscillator is accurate to within .0001 Hz. Why would you want to have such an accurate oscillator? – There are future plans to re-instate the simulcast system on VHF and it is very important to have very accurate frequency and audio timing. The new 147.260 VHF repeater is a GE MASTR-III, recycled from commercial service. This repeater has an external reference input, which allows the transmit and receiver frequency to be clocked to the 10 MHz reference. The amplifier is capable of 110W output, set to 60W output. The repeater outputs a CTCSS tone of 156.7Hz. The 444.950 UHF repeater is built from a TAIT T850 – series II, also recycled from commercial service. This repeater is capable of 100W output. This repeater outputs a CTCSS tone of 156.7Hz, but only when there is a valid signal on the input. This is to facilitate the IRLP node receiver at the Gerry Brewer Building. This repeater was installed in the summer, but due to a faulty fuse, it has been offline for a number of months.